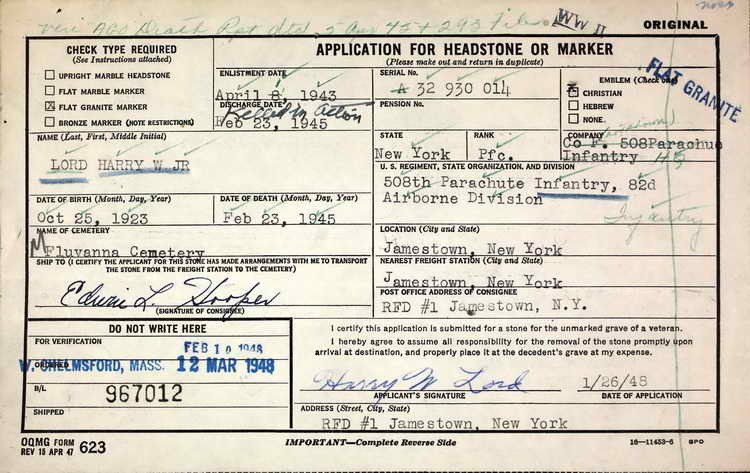 PFC HARRY W. LORD, JR. 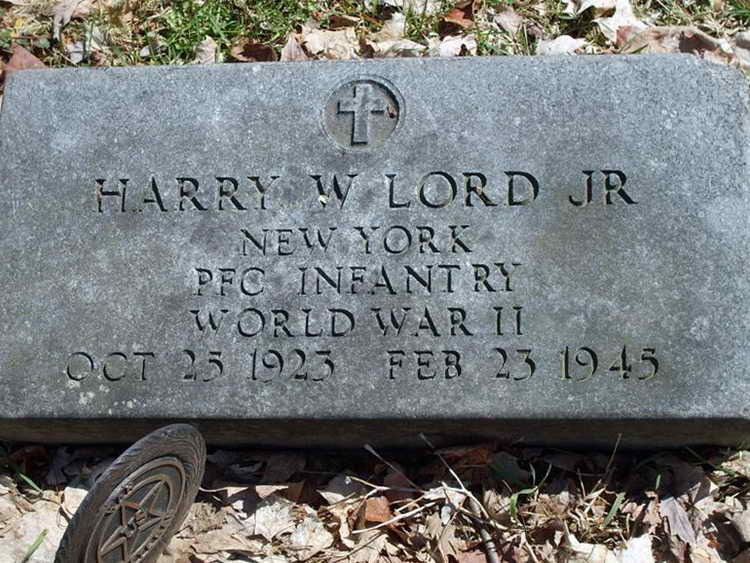 Grave marker application and resulting marker for Pfc Harry W. Lord, Jr. at Lot 14 1/2, Tree Section, Grave 4 in the Fluvanna Cemetery, Ellicott (Chautauqua), New York. Note that the application shows that Pfc Lord was killed in action on 23 February 1945. Morning Report entries however, paint a highly confused picture. On 23 February 1945 he was listed as having been sent to a hospital due to illness on 21 Feb 45 and it was classed as a non-battle related condition. The March 1st report, however, corrects that entry to read as "seriously injured in action 21 Feb 45 (Battle Casualty)" and he was then classed as having "died of injuries on 23 Feb 45 (Battle Casualty)." Then on 16 March, the entries of "seriously injured in action and "died of injuries are withdrawn and replaced by the original status of "sick in hospital, 21 Feb 45; and " deceased 23 Feb 45 (non battle)"
Obviously the reports reaching the company from whatever field hospital Pfc Lord was in were continually changing. The one inescapable fact was that he was deceased.